Fresh Air is an iPhone and Apple Watch app that instantly gives you the air quality for your location. Fresh Air provides you with real-time air quality information (both AQI and category) at a glance for your current location. 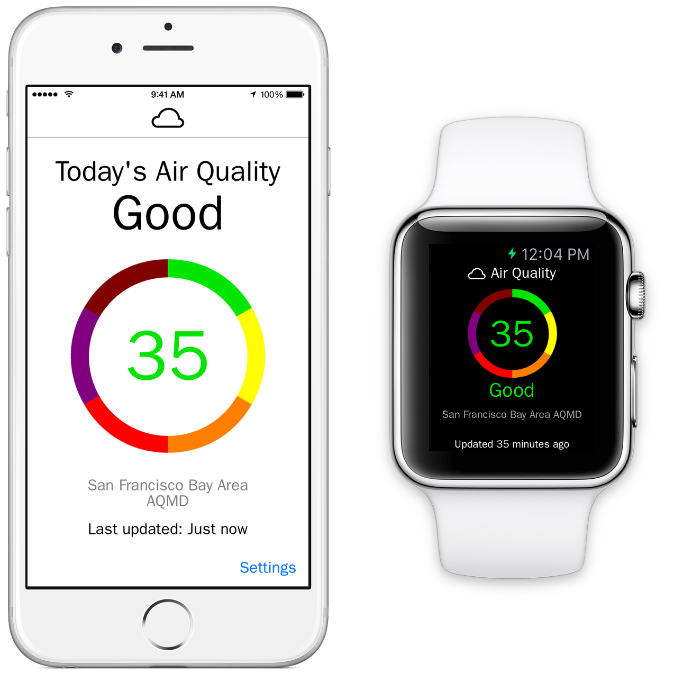 If the air quality worsens, Fresh Air notifies you instantly — on your iPhone or Apple Watch! The EPA developed the air quality index (AQI) and color-coded categories (green, yellow, orange, red, purple, maroon) which reports levels of ozone, particle pollution, and other common air pollutants on the same scale. A higher AQI rating indicates a worse air quality. For people with asthma and other lung disease, poor air quality can make symptoms like coughing and wheezing worse. Even healthy adults who are active outdoors are at risk from ozone, which can make it more difficult to breathe deeply. GDPR Info: The Fresh Air app (both iPhone and Watch OS) do not collect any data. Any location data used is strictly for determining the closest Air Quality station. Location data does not leave the device. If the air quality worsens, Fresh Air can notify you (on your iPhone or Apple Watch) instantly. 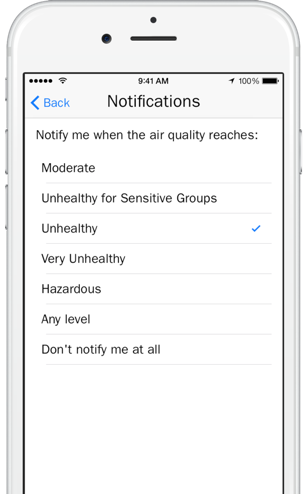 Granular notifications allow you to receive notifications when the air quality category reaches a certain level. Fresh Air works both with and without an Apple Watch. Notifications will route to your iPhone or Apple Watch automatically.